whose generous donation funded the establishment of this website." The Templeton Historical Museum Society was incorporated as a nonprofit organization in 1989, the realization of a dream of nearly 25 years earlier. The Horstman house, built in the 1920s by Albert Horstman, a prominent Templeton businessman, was donated to the society in 1994, and it serves as the museum where local memorabilia and photographs are displayed. Templeton's original railroad warehouse (behind the house) contains a 1925 Model T in original condition, an antique carriage and other items too large to put into the house. 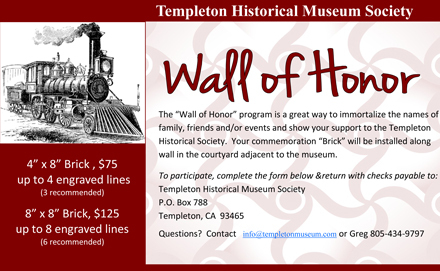 The museum is open Friday, Saturday and Sunday from 1:00 to 4:00 p.m.
Templeton is located halfway between Los Angeles and San Francisco on Highway 101, 5 miles south of Paso Robles. You can assist the efforts of the Museum by participating in one of two fund raising events. The first is a direct fundraising effort for the Bus Restoration. 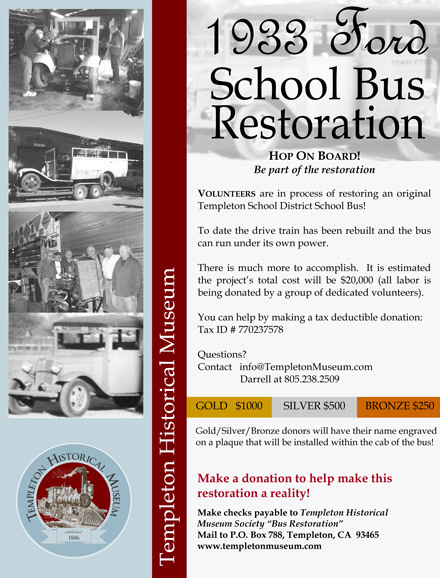 Funds generated will go directly to the Bus Restoration fund. Click here to view a .pdf flyer for more information on how you can help. The second event is the Wall of Honor project. Funds from this project will go into the general operating fund. 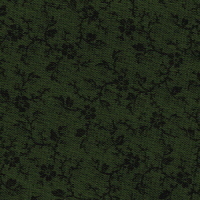 Click here to view a .pdf flyer.